Easter can be a tricky holiday for vegetarians and vegans. But even when tradition calls for meat on the table, you can still mix it up and add something new to long-standing family customs — the meat-eaters in your home can have their ham and a taste of what pure vegetarian dining is all about. This Easter Sunday I made a creamy pasta dish and simple roasted pears — wonderful on their own, or fabulous additions to an already-impressive holiday spread. 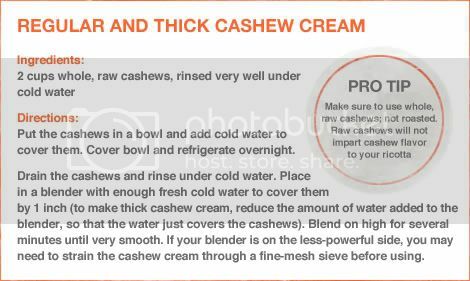 If you're making this dinner and dessert together, the entire meal should take less than 2 hours, including prep time, from start to finish. 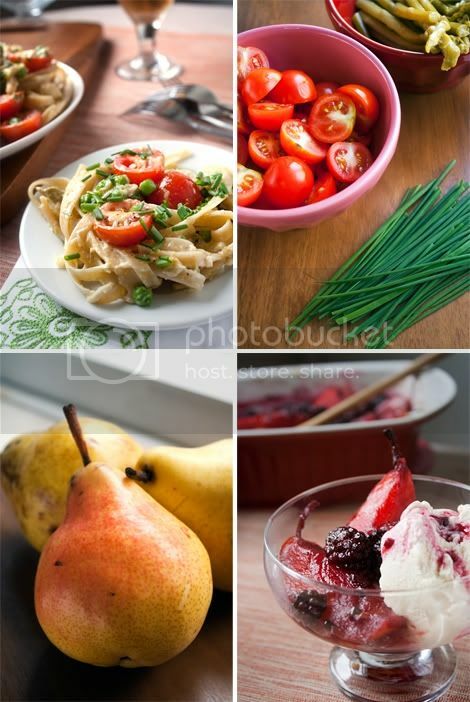 I started with the pears, then began the pasta dish once they were roasting away in the oven. To start: Melt Earth Balance in a large skillet over medium-low heat. Add asparagus, peas, cashew cream and and soy creamer and simmer until cream is reduced by 1/3, about 2 minutes. Turn off heat. Mix in cherry tomatoes. In the meantime: Bring a large pot of water to a boil and add 2 tablespoons sea salt, along with reserved asparagus water. Add pasta, let water return to a boil and cook until tender but still firm to bite, stirring occasionally (about 11 minutes). Drain. Add pasta to skillet with sauce and toss to coat over low heat. Season to taste with salt and pepper. Remove from heat. Stir in Daiya. Transfer to a large bowl; sprinkle with chives and serve. To start: Preheat oven to 375°F. Place the sugar in a small bowl. With a thin, sharp knife, split the vanilla bean lengthwise in half and scrape out the seeds. Stir the seeds into the sugar and set aside. 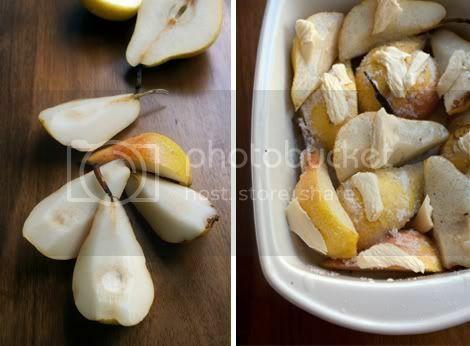 Prepare the pears for roasting: Arrange the pears in a baking dish, cut-side up. Drizzle the lemon juice evenly over the fruit, then sprinkle with the sugar mixture. Nestle the vanilla pod among the fruit. Dot each pear with some Earth Balance. Roast the pears: Place the dish in the oven for 30 minutes. Remove dish from the oven and turn the pears over. 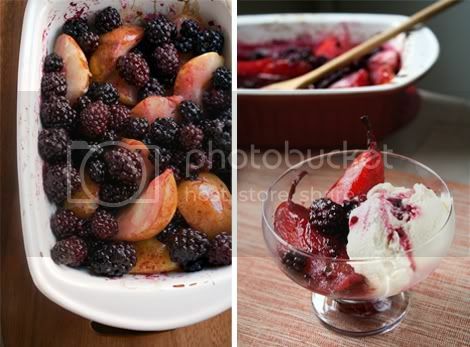 Add the frozen blackberries to the dish, spreading them over the pears and letting them settle and mix in. Drizzle the chocolate extract evenly over pears and berries before returning to the oven and continuing to roast until tender and caramelized, 25 to 30 minutes longer. Serve warm over ice cream, with the blackberries and chocolate infused juices from the pan spooned over top.